Perhaps you've realized the tiny cup your betta came in isn't an ideal permanent home. Or maybe you've just brought your betta home and are ready to move her to your fish tank. In either case, transferring a betta is not challenging and simply requires a little advanced planning. Bettas thrive in water between 70 and 80 degrees Fahrenheit, and prefer to be away from direct sunlight, which can elevate the temperature too high. Although they are often sold in tiny cups, they need at least one gallon of clean water, and their tanks must be sufficiently oxygenated. A life plant or air stone can help you achieve sufficient oxygenation. Ensure that the tank to which you're transferring your betta meets these minimum requirements. Use a fish net to catch your betta. The net should be at least double the size of the width of your betta's fins. Otherwise, you may snag and tear the fish's fins. Use the net to capture the fish in the water by gently looping it around your betta. Promptly remove the fish from the water, then flip the net upside down to put the betta in a holding container filled with water. If the water temperature of the new tank is different from that of the old tank, your betta will need a few hours to acclimate. If you just bought the fish from a fish store, place the bag containing the fish into the water and allow it to float for a few hours before releasing your fish. 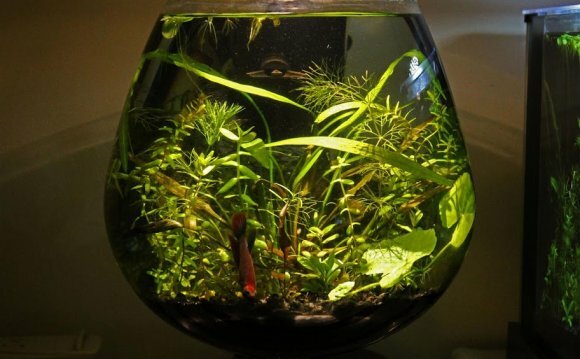 If you are moving your fish from one tank to another, put the fish in a small floating tank inside the larger tank for a few hours to give your fish time to adjust. Then dump the container upside down to deposit your fish into the new tank. An alternative way to transfer your betta to a tank with a dramatically different water temperature or pH is to use the water switching method. Fill the new tank 25 percent with water at the appropriate pH and temperature. Then fill the rest of the way with water from the tank your betta is currently in. Gradually alter the water temperature by a degree or two every week until the temperature is at the appropriate level.